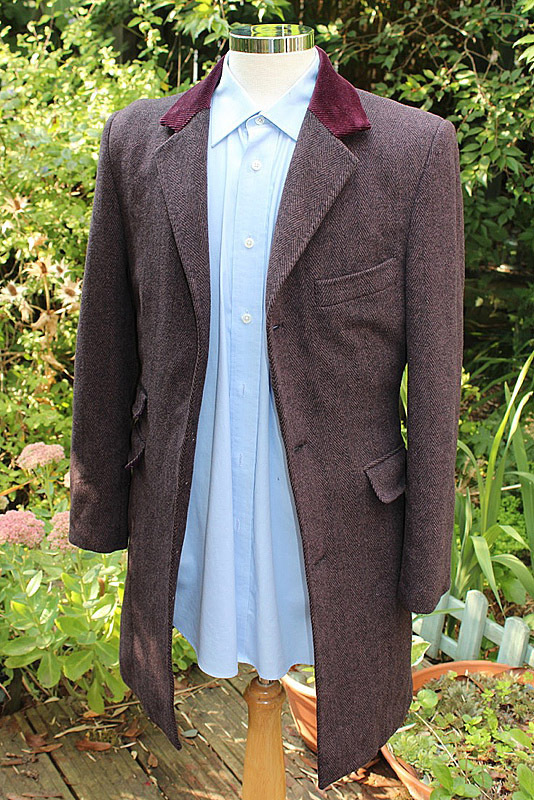 Finding an exact copy of the Cashmere Frock Coat worn in series 7b is a near impossible task. 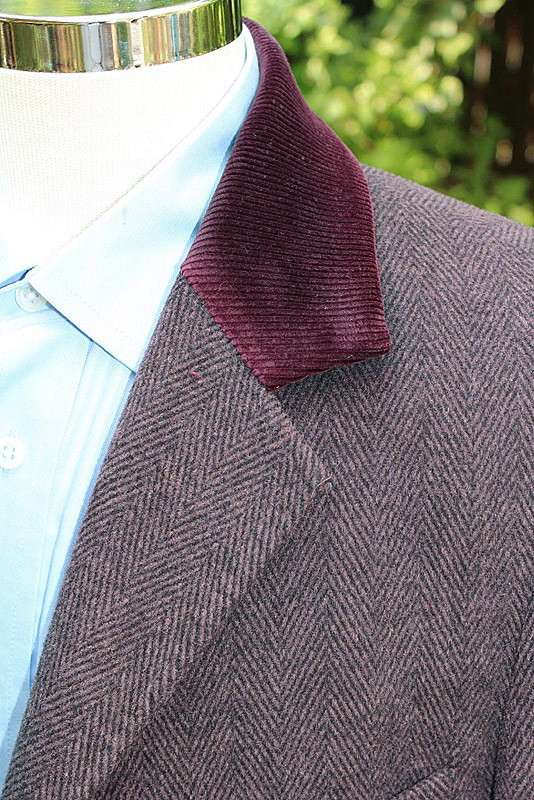 The cut of the coat may look pretty standard, but it is to an old fashioned pattern, so try as you might you won’t find a match on any typical high street anytime soon. Don’t get me started on the fabric used, as you really won’t find anything that comes close to matching its weave and look. That said a number of canny cosplayers have found three-quarter length smart coats which block out the shape and style of the Frock Coat pretty well. They aren’t 100% right, but once worn with a bow tie and waistcoat and brandishing a sonic - the effect comes together! But the one thing they rarely have is a purple corduroy collar. If they do come with a contrasting collar it is often black and nearly always velvet. 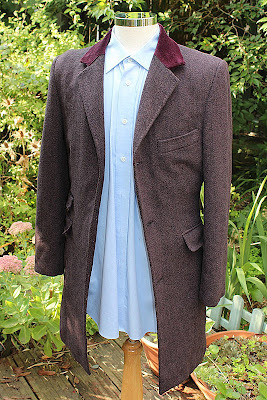 A good friend of mine has sent me one such coat and has asked me to revamp the collar with some appropriately coloured corduroy fabric I have left over from making my own screen accurate coat. 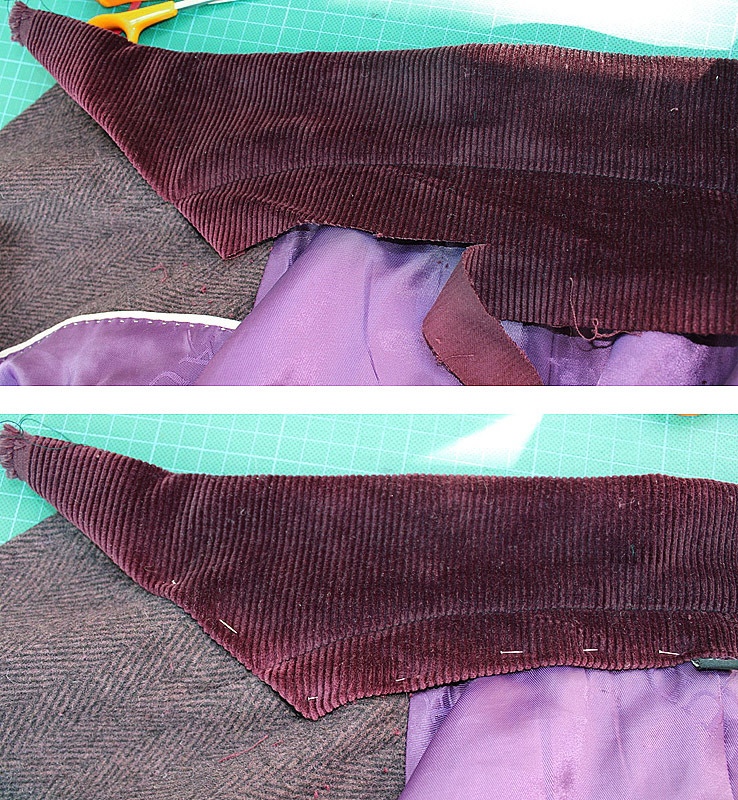 As you can see, this coat has a black velvet collar, over which I am going to wrap my purple corduroy fabric. Applying this is actually very easy - so long as you know what you’re doing. Here is how I did it, pulling in some of my hand tailoring skills to give it a professional finish but using surprisingly simple techniques. All it involves is CUTTING, a bit of MACHINE STITCHING and then a little HAND STITCHING to finish it off. First we need to work out how much cloth to cut. 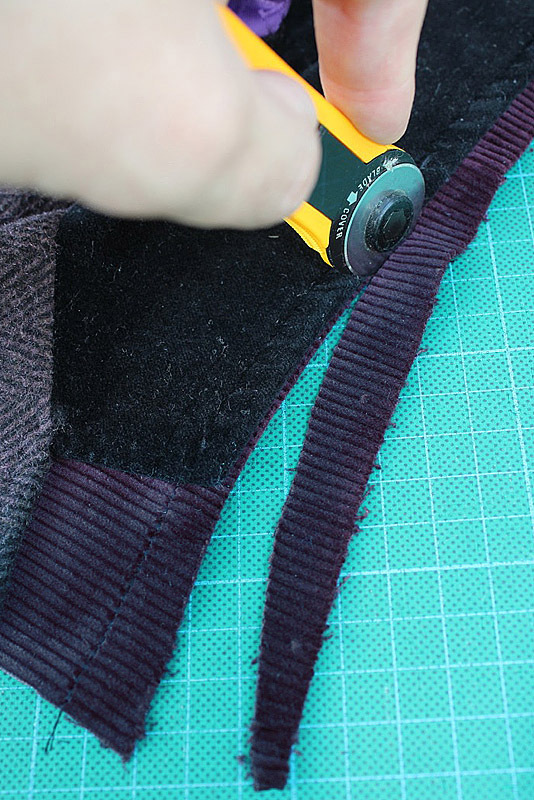 Lay the collar out flat and measure the length, adding 2 inches for either end. Then measure the height, adding an inch above and a good 2 inches below. 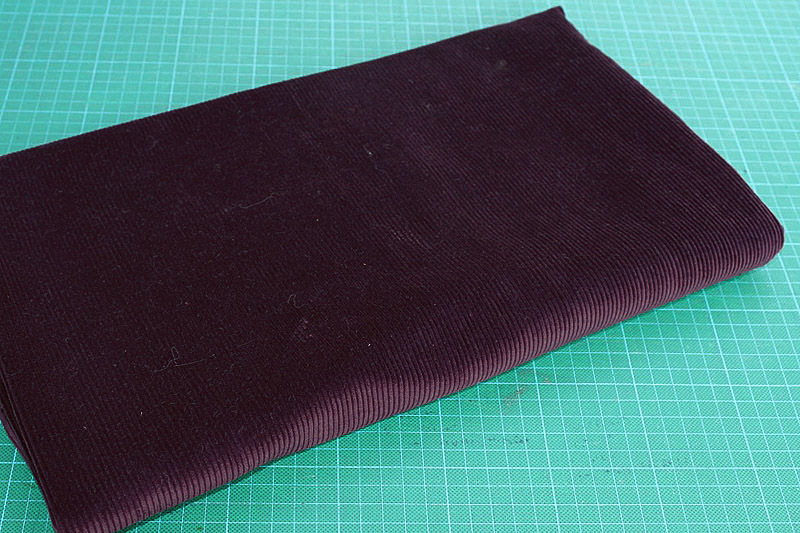 I then cut this in corduroy - 20 x 6 inches in this case, making sure the lines in the fabric run parallel the shortest edges. Next I lay the corduroy right sides up and position the collar right sides up also with the edge of the collar close to the edge of the fabric. A coat collar often has a gentle curve to the edge. Don’t worry about this - just lay the collar flat. I pin the collar points, and the space between. 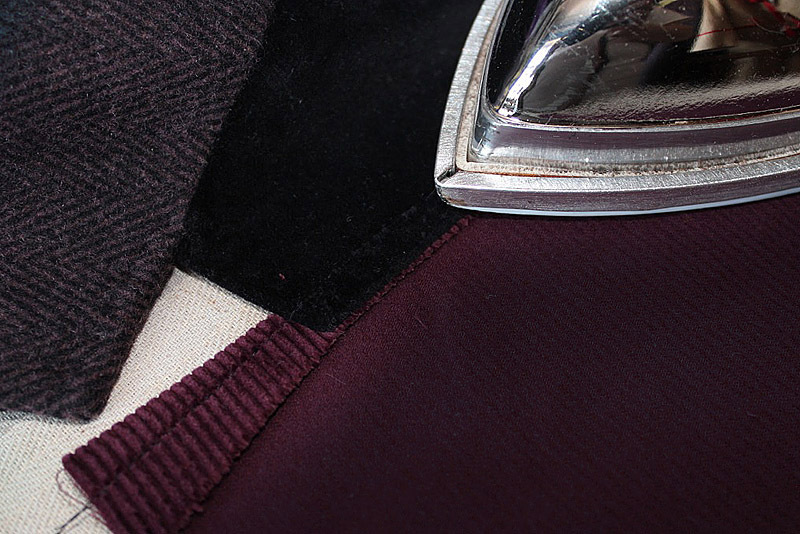 Notice the pins are at right-angles to the collar edge. I then sew along the collar, roughly 1cm from the edge, following any curve or shape it may have. 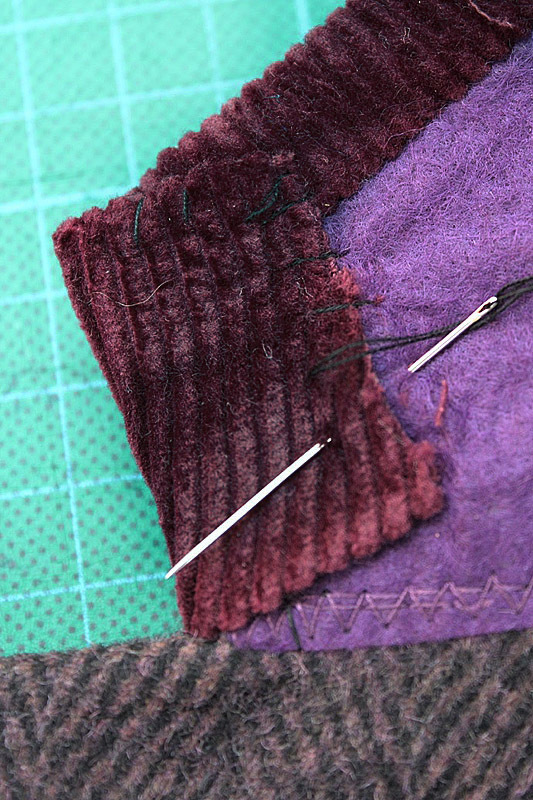 I start on the corduroy, catch the collar, then overshoot and finish on the corduroy the other end. This helps anchor the stitching and will not show. With the pins at the angle they were, I was able to sew without removing them and avoided the machine needle breaking if it were to hit the pins. I then return to my cutting mat and trim the excess corduroy along the length of the collar. It’s best to leave as much fabric beyond the collar points for now. it can always be trimmed later. Next I need to press the fabric around the collar to bind the edge. First with the collar right side up, I flap the corduroy underneath away form the collar, pulling it tight along the stitched edge and firmly press. I am pressing from this side so the pile of the fabric doesn’t get crushed. 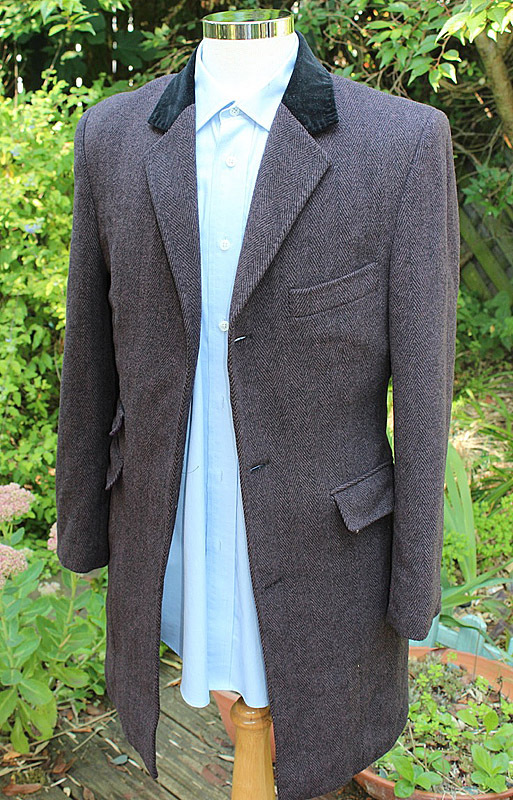 Then I flip the collar over and wrap the corduroy back around the collar edge, binding it. This needs to be folded nice and tight then pressed firmly. Again, I am pressing from the back to protect the public side of the fabric. 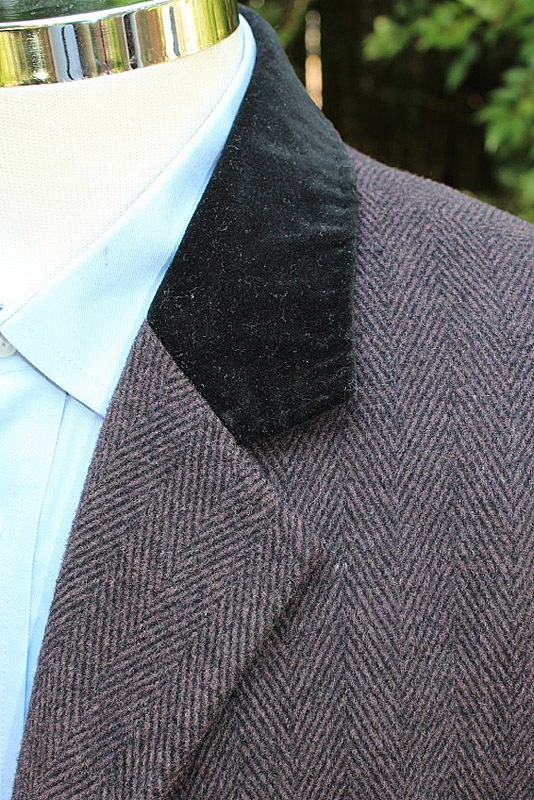 Now, this coat has a line of machine stitching along the roll line of the collar. You can see it about an inch up on the black velvet. 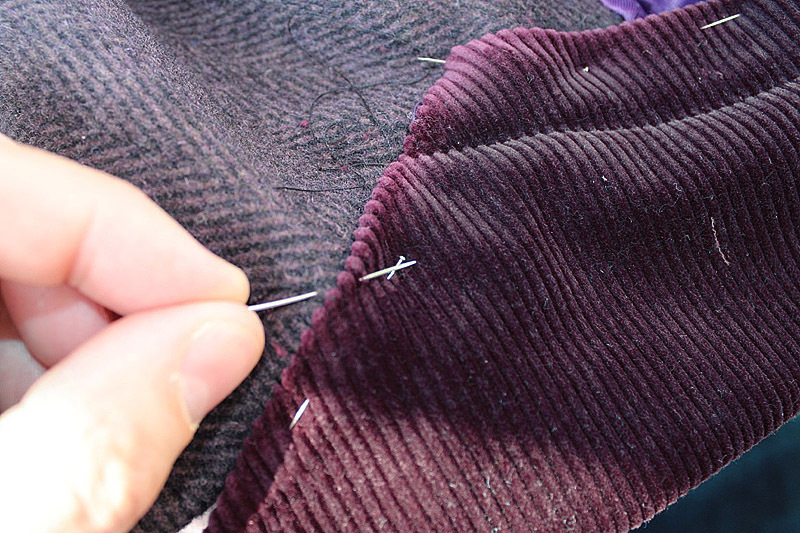 I am going to use this to my distinct advantage as you will see later, but first I must establish the edge of the gorge - the join between the collar and lapel leading away from the notch. 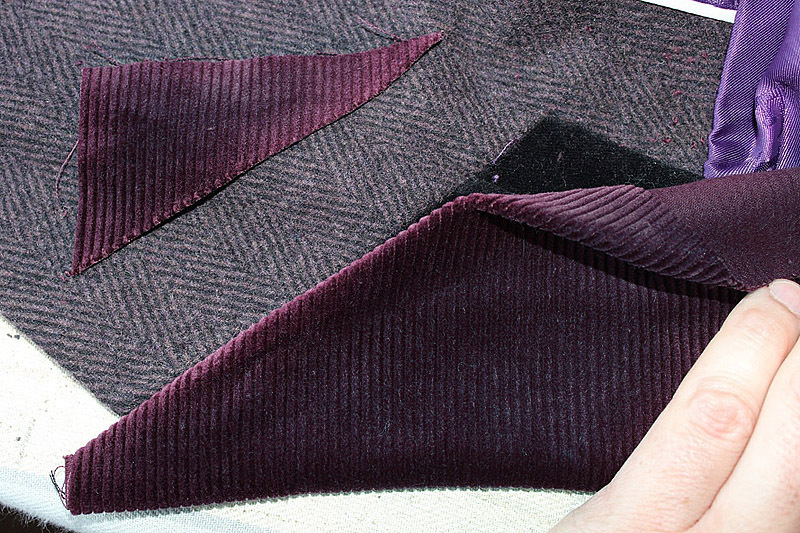 I fold the corner over to match the angle of the velvet, then cut away the excess to give me approx a 1cm seam allowance to fold under. I do this at both ends and pin along the machined roll line, keeping the fabric flat and tight form the already sewn edge of the collar. On the underside of the collar I can see the original line of stitching, so I sew along this, overshooting a bit at each end. 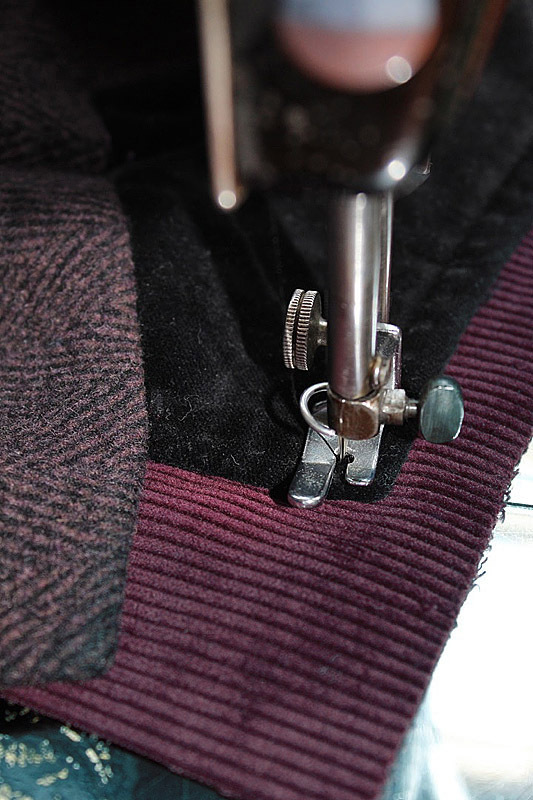 I will then unpick the stitching back to the exact edge of the corduroy and tie the ends off neatly. This is easier than trying to second guess where the fabric is on the underside of the work. That’s the last of the machine stitching needed to do the collar, and what you should have is the corduory bound around the long edge of the collar; the fabric attached along the machined roll line; the edges folded under along the gorge and caught by the machine roll line stitch; and rough fabric along the bottom edge with two points at the collar ends. All of the rest of the collar is now hand stitched, but it is really simple to do. First I trim the excess along the bottom to give me a 1cm seam allowance which I turn under to match the neckline of the existing collar. I pin it in place. This is were sewing the roll line pays off. The public face of the collar has already been secured top and bottom and I am now only tethering the one inch or so along the neckline. I now hand stitch the corduroy to the coat around the neck line, from notch to notch. This is the most time consuming part of the job - but once you get going it doesn’t take too long really. You don’t need to make the stitches too close together, say around 3-5mm apart is fine. 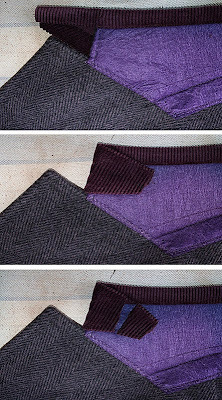 The corduroy can be quite forgiving and you should find your stitches disappear into the pile of the fabric. Now the simplest and cleverest part of the job. 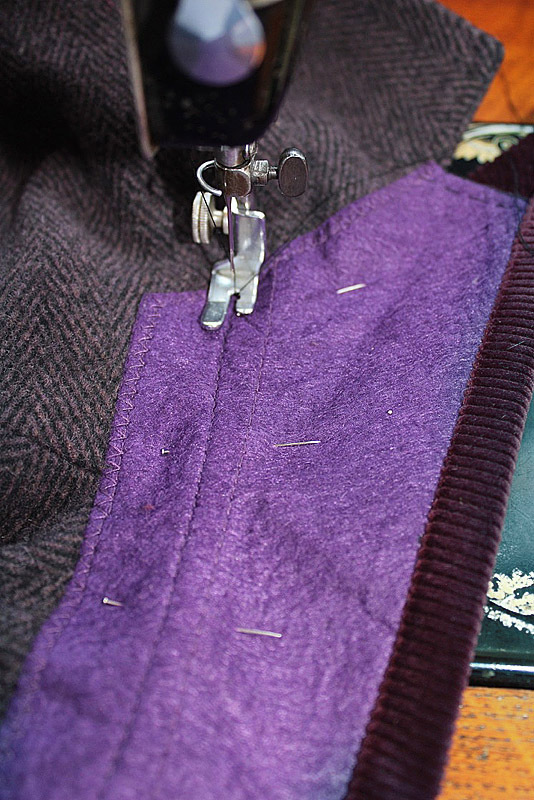 I always like how easy this is when I am tailoring a jacket. With the collar face down, fold the excess which forms a sort of tab around the front edge of the collar and press very firmly. Cut away the tab, leaving a 1 inch flap. 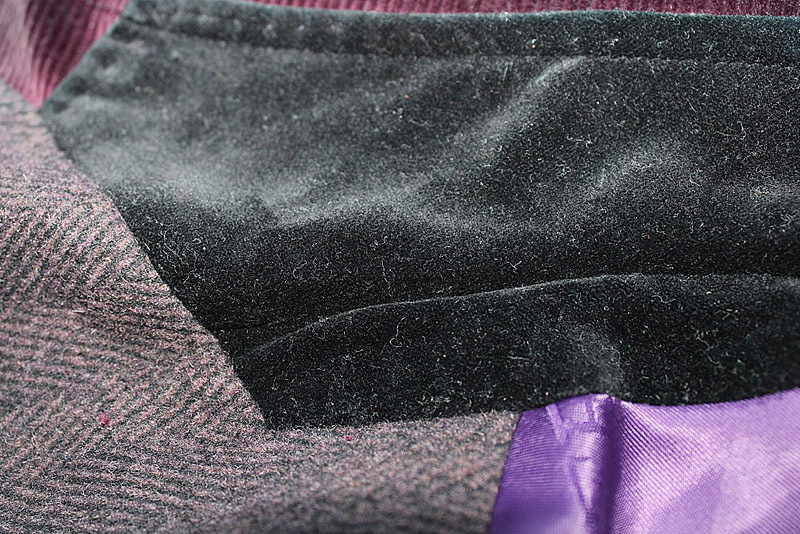 Inside the tab trim away any excess of folding to stop bulking. Then carefully stitch the tab down to the under collar (usually a felt fabric) making sure you do not come through to the front. One final press of the whole collar FROM THE REVERSE SIDE - don’t go pressing the corduroy or you could ruin it - and you are all done! Hopefully you have found this quite a simple change to make, but a very effective end result. Compared to how it looked before, it makes all the difference to cheap coat for the budget cosplayer. Just so you can see, here is before and after. If you gave this a go I’d love to hear how you got on and see your end result. It's scary how good you've become at tailoring. I still remember all the posts about you going tailoring classes! 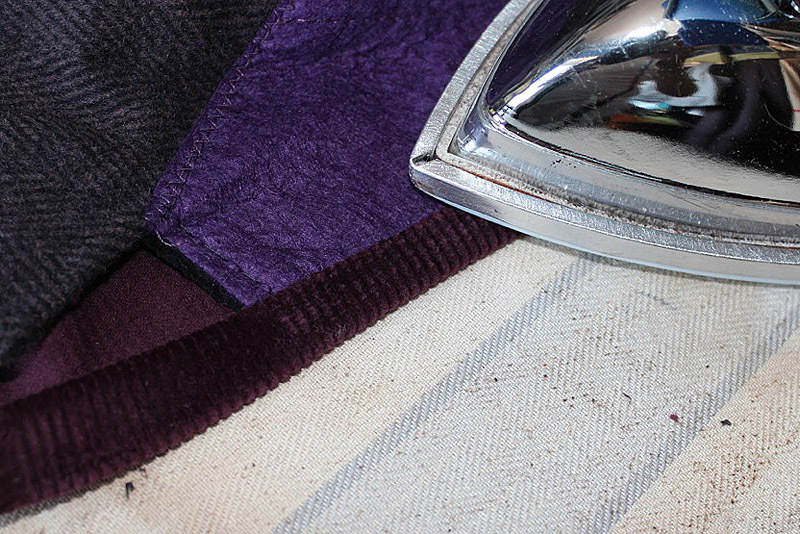 That purple corduroy looks particularly nice by the way. It's amazing how this simple addition raises the coat to look just that little bit more screen accurate. Where did they get that coat? Where can I find a coat like that? It's a nice one. I love your blog! It has so many hi-res pics of 11, which I might've missed on the internet. Thank you for the references! Oh my giddy aunt. Steve, have you seen the new Abbyshot purple coat replica? They just released a sneak peek of it today if you were on their mailing list. Though you could probably find a picture of it on their Facebook page. All I can say is that they know what they're doing! Do you know what type of pattern/vest Smith wears in season 7.2 and wear to get it or something like it?